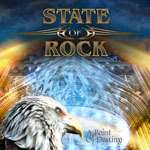 State Of The Rock is a new band, although the band members are very experienced musically with three members of Frontline joined by TNT/Shy vocalist Tony Mills. Tony Mills certainly is a busy man as he guested on the recently release Acacia Avenue album and handles vocals on the upcoming album from Serpentine. The opening song 'Black & Blue', sets the scene well with big riffs and listen out for the tinkly synth! The big, bold hard rock tune 'Heartless Dreamer' could have come of a latter day Shy album. There really are some enjoyable riff-filled songs on here like 'Without My Love' and 'Friction', the album's stand out song for me with a superb guitar solo from Robby Bobel. Of course you need a ballad from a band like this and 'Don't Make Me Cry Again' fits the bill nicely. It's also an opportunity for Tony Mills to show the mellower side of his voice. An impressive debut that will please not only fans of Frontline and Shy but those who enjoy melodic hard rock. What sets this apart from other current hard rock releases is that this sounds like a band recording together as opposed to a project throwing name musicians together to see what happens. Live dates are a must as this band could really be something special. More please!